We just received a tip about a new upcoming tablet the Samsung GT-N5100. What kind of tablet it will be is a question of course, maybe a small Galaxy Note 7.0 varaint? Samsung introduced the Galaxy Note 10.1 at MWC 2012 in Barcelona. There is no information about sales numbers. But a new high-end pocket tablet to fight the iPad Mini is always welcome! 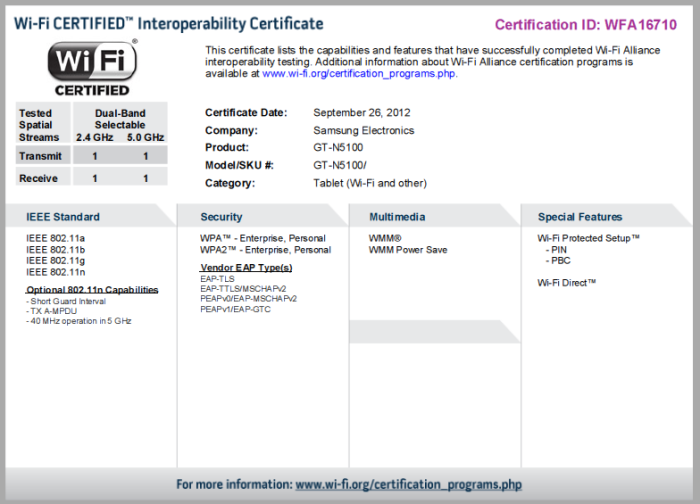 The information has been spotted thanks to the WIFI certification systems.